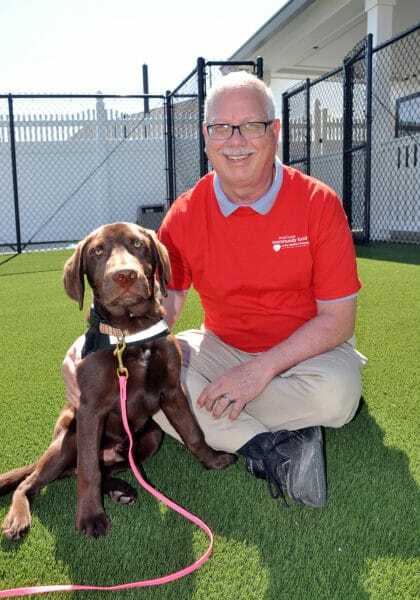 Boeing Facilitator Keith Mack meets Chip, the 6-month old chocolate Labrador retriever that is being trained to become a therapeutic facility dog for United Services for Children in St. Peters. The Employees Community Fund of Boeing provided a $3,000 grant to help the nonprofit children’s agency care for the dog, which is being trained to help children with disabilities receive therapy and early intervention services. The Employees Community Fund (ECF) of The Boeing Company has awarded United Services for Children $3,000 to support the organization’s acquisition of a therapeutic facility dog. Boeing Facilitator Keith Mack said ECF supported the plan because it aligned with the organization’s focus on early learning and preparing young children to be successful in kindergarten and beyond. The chocolate Labrador retriever, named “Chip,” will assist children with developmental disabilities such as autism and Down syndrome. United Services for Children obtained the dog through a collaboration with two O’Fallon businesses, The Pet Doctor and The Yuppy Puppy pet spa. The Boeing ECF grant will help offset the costs of caring for Chip, who is undergoing an 18-month service dog training program administered by certified trainers at The Yuppy Puppy. Once training is complete, the dog will begin working fulltime at United Services for Children. Denise Liebel, president and CEO of United Services, said the dog will perform a vital role in breaking through to children who, due to their disabilities, have become closed to the outside world. Some children will not talk or make eye contact. They fear changes in their environment, such as moving from one room to another. Chip will be trained to calm these children and assist them during therapy sessions and early intervention activities.